Birdland was packed Thursday afternoon for the Baltimore Orioles home opener against the Yankees. 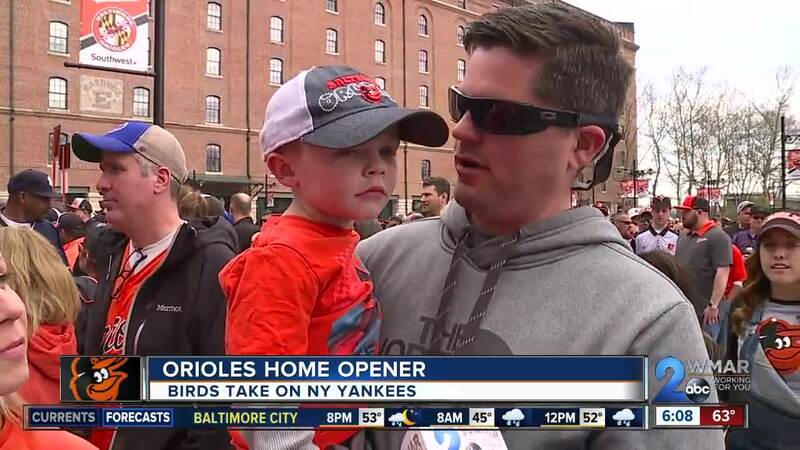 The Orioles came up short but the fans are still optimistic for the season. "Let's keep it going. See what we got this year. It's a whole lot of nobodies so I think we got a run at the world series," said Charlie Franklin, a fan at his 18th opening day Orioles game. Another man who makes this day a tradition is Benjamin Marks. He said, "I’m very excited about the birds this year. I love our baby birds. Anything can be better than last year." Marks lives right next door to the stadium and said he just couldn't miss opening day. He said he's been coming to opening day since he moved next door and he was definitely dressed for the part. "Camouflage pants are my go to gear. Ridgely’s Delight which is my neighborhood that I’m very proud of because we border the stadium and this is a classic shirt,” said Marks. While some make it a yearly event, others were at opening day for the first time. “We wanted to bring the kids to their first ball game today,” said James Wood. His wife, Stephanie, added, “I’m really excited to be here with them. They haven’t been to a real live baseball game before." Several kids had gloves in their hands hoping to catch their first ball but everyone just wanted to see the O's win. "I'm looking forward to win the game, for the O's to win the game," said Jake and Brody, two young fans. Unfortunately, the Orioles didn't win but they still have more wins than losses, 4-1. BALTIMORE — Birdland was packed Thursday afternoon for the Baltimore Orioles home opener against the Yankees. The Orioles came up short but the fans are still optimistic for the season. "Let's keep it going. See what we got this year. It's a whole lot of nobodies so I think we got a run at the world series," said Charlie Franklin, a fan at his 18th opening day Orioles game. Another man who makes this day a tradition is Benjamin Marks. He said, "I’m very excited about the birds this year. I love our baby birds. Anything can be better than last year." Marks lives right next door to the stadium and said he just couldn't miss opening day. He said he's been coming to opening day since he moved next door and he was definitely dressed for the part. "Camouflage pants are my go to gear. Ridgely’s Delight which is my neighborhood that I’m very proud of because we border the stadium and this is a classic shirt,” said Marks. While some make it a yearly event, others were at opening day for the first time. “We wanted to bring the kids to their first ball game today,” said James Wood. His wife, Stephanie, added, “I’m really excited to be here with them. They haven’t been to a real live baseball game before." Several kids had gloves in their hands hoping to catch their first ball but everyone just wanted to see the O's win. "I'm looking forward to win the game, for the O's to win the game," said Jake and Brody, two young fans. Unfortunately, the Orioles didn't win but they still have more wins than losses, 4-1.